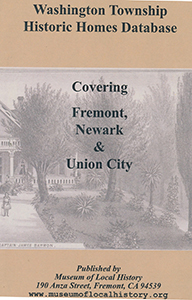 The Washington Township Historical Homes Database is a list of the historic homes in Fremont, Newark, and Union City that have been surveyed and a DPR form 523 has been filled out. Each city has performed an historic homes survey. The database contains information about each of these homes, including a recent picture. The CD also has the original DPR 523 forms witch contains more information. OpenOffice Base or LibreOffice Base is needed to read the database. Both of these applications are Open Source and freely available as download from www.openoffice.org or www.libreoffice.org.